A couple that I counseled recently, Tonia and Jack, both in their late forties, remarried for ten years and raising two children, have ghosts from their prior relationships that have an impact on their communication. In fact, Tonia feels that issues she had in her first marriage sometimes clouded her view of Jack so much so that she has thought of ending their marriage. The unfinished business that Tonia describes can easily lead to hurt feelings and power struggles between her and Jack. They are both deeply entrenched in believing they’re right and trying to prove a point. As a result, it’s essential to make sure they feel heard by each other and that they respond in a way that seems “acceptable” to both of them. According to Drs. John and Julie Gottman, authors the Science of Couples and Family Therapy “Both partners must work for the other’s benefit in order to build the trust metric. The answer is not given to get, it’s just given to give.” For Tonia and Jack to feel safe enough to trust each other, participate in a true partnership where they are both getting some (but not all) of their needs met, they must stop trying to prove they’re right and end power struggles. In Making Marriage Simple, Dr. Harville Hendrix, and Dr. Helen LaKelly Hunt suggests that the tension of opposites is a vital aspect of couples healing childhood wounds. It can give them the energy to heal “raw spots” from prior relationships. 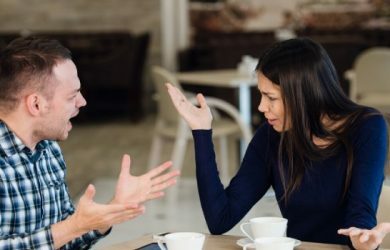 But if understood and dealt with in a healthy way, power struggles can give couples the energy to work on problems and can be a catalyst to building a strong connection and emotional resiliency as a couple. If your marriage is a true partnership that helps you grow as a couple and individually, it can help you put an end to power struggles. This type of marriage is only possible if you have compatibility with someone, make a commitment to accept each other’s differences and grow together. To have chemistry and compatibility with one person is possible. Chemistry is a complex emotional or psychological interaction between two people and it may cause a couple to feel passionate and attracted to each other. Compatibility can be defined as an authentic connection with a partner who you admire. You like and respect who they are and how they carry themselves through the world. In the beginning of a relationship, we tend to present our best selves and only see the best in our partners. But that honeymoon stage always ends, and disillusionment can set in. A supportive partner helps you navigate the unpredictable, ever-changing aspects of life as your vulnerabilities are exposed and disagreements arise. Chemistry can help you weather the storms of life, but compatibility enables you to set goals and find shared meaning in your relationship. Today, many couples strive to have a “Partnership Marriage” – a marriage that is greater than each person – characterized by couples helping each other grow and develop throughout adulthood. According to Hendrix and LaKelly Hunt, the healing of each other’s childhood wounds is at the heart of the “Partnership Marriage.” Couples who are partners are able to resolve power struggles and avoid blaming each other when they have a difference of opinion. In fact, when partners have a disagreement, they’re likely to look for deeper connection and support from each other. In this way, a couple will take each other’s side in times of trouble rather than pointing their fingers at each other or trying to gain power or control. For instance, Jack would like to get a graduate degree in business and he knows that Tonia would eventually like to open a small private school specializing in supporting children with autism and other childhood disorders. Achieving these goals will require that they work together as a team to support each other and their two children in reaching them. Focusing on being especially compassionate when you’re going through a rough spot in your marriage or remarriage can go far to creating a safe emotional space where you can both thrive. This safety net can help to promote intimacy and understanding without winners and losers (no one wins). The relationship wins when you both generate a solution within the context of a loving relationship.